Looking for the perfect gift? Give the gift of Sixthman to your friends and family for birthdays, holidays, or for no reason at all. Your recipient will LIVE LOUD on the vacation of their dreams! 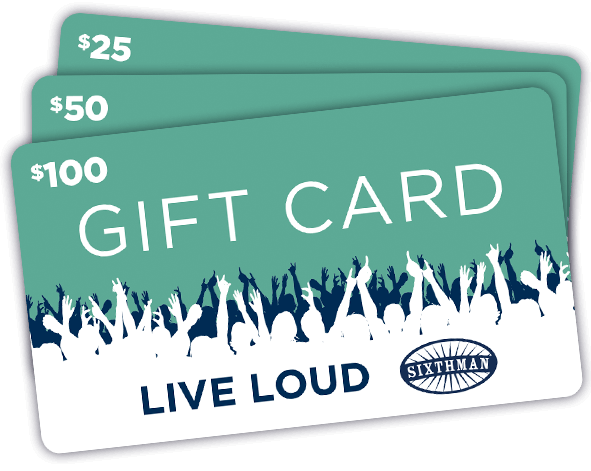 Sixthman Gift Cards can be used as a payment on a reservation. For cruise event reservations already paid in full, they can be applied as on board credit to cover drinks, merchandise, spa treatments, excursions, specialty dining and more! If you already have a Sixthman Username, sign-in here to continue. If you don't have a Sixthman Username, create one using this form to continue. In what increments can Sixthman Gift Cards be purchased? Gift cards can be purchased in any amount between $20 and $1000. Are Sixthman Gift Cards refundable? No. Once purchased, gift cards are non-refundable. How do I give a Sixthman Gift Card to someone else? Simply provide the gift card # and the gift card value to the recipient. We recommend printing the information, putting it in a REALLY large envelope, finding a GIANT bow and putting it in the recipient’s driveway. Are physical gift cards available? We do not have physical cards available. The card graphics on this website are just for looks. Everything is digital, however once you purchase, you'll have an option to print a certificate with all the details. When can gift cards be redeemed? Can they be redeemed during the event? Gift cards must be redeemed at least 14 days prior to the event and cannot be redeemed during the event. How do I redeem a Sixthman Gift Card on an existing reservation? Redeem your gift card at least 14 days prior to sailing by logging in to your account and clicking "Apply a Sixthman Gift Card" under Current Reservations. Upon redemption, the full value of your gift card will be applied to the reservation you specify. If the value of the gift card is higher than the balance on the cabin, the excess amount will be applied as Onboard Credit. How do I redeem a Sixthman Gift Card for a new reservation? If you book online you will need to make an initial payment (of any amount) via credit or debit card. Then, follow the directions above to apply your gift card to your existing reservation. Are there any fees associated with the Sixthman Gift Cards? Do they expire? No, there are no fees and they do not expire. Can Sixthman Gift Cards be applied to reservations made directly with Norwegian Cruise Line? No. Sixthman Gift Cards can only be applied to reservations made via Sixthman. Sixthman Gift Cards cannot be redeemed on regular Norwegian sailings. Does a Sixthman Gift Card guarantee a room? No. Having a Sixthman Gift Card does not guarantee that a room will be available to purchase. Gift card holders need to go through the normal process to book a room, including the pre-sale sign-up process for events that are in pre-sale status. What if I lose the gift card information? Upon purchase you will receive an email with the gift card information. Please treat the gift card number like cash. The gift card cannot be replaced if lost. If you don’t receive a confirmation email after purchase please check your spam folder and then contact Sixthman and we’ll help you out! My portion of the reservation is paid off, but there's still a balance. Can my gift card be applied as onboard credit during a cruise event? Yes, and our team will be happy to assist you with this. Please call us directly to apply your gift card as onboard credit to be used towards purchases made on board during the cruise, such as drinks, specialty dining, shore tours, casino, and even event merchandise!